I haven't posted the photos I've taken over the past couple of days so I thought a 5 Happy Things post was in order! 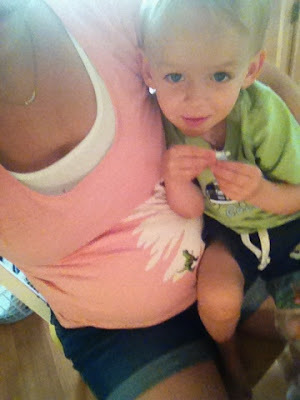 1) Hello third trimester! Nesting is in full effect and we are beginning to prepare Ayden more and more (as well as soaking up all of our two on one time!!). Sharing some stickers with his baby brother. We need to get a few books for him that talk about baby's arrival. Any recommendations? 2) Lots of outside time! 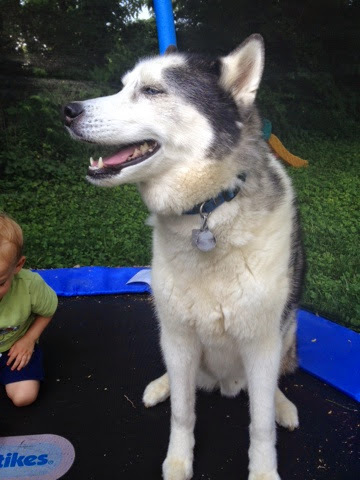 Maverick is totally on the trampoline with us! He actually liked it. I think he thought it was a glorified crate. 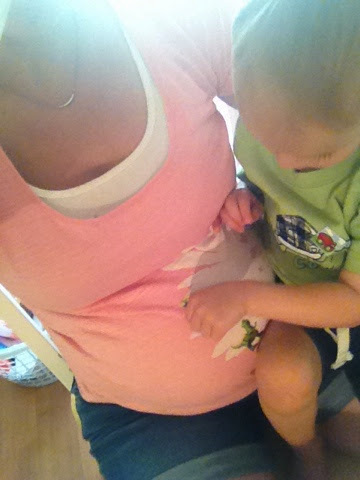 3) Ayden and I seem to share a love for berries! The boy can't get enough. 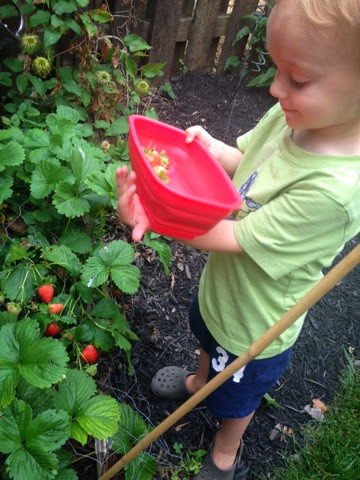 Strawberry picking in his Grandma and Grandpa's backyard. We hosted playgroup today and the kids had a blast in our yard. Feels so good to open our home to such good people. 5) Surprises from my love. 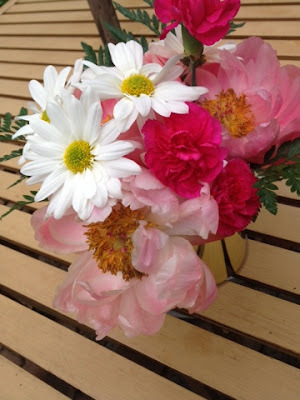 Fresh flowers add so much charm to a space. I have been enjoying these beauties so much! There are my 5 happy things at the moment. I really do love the warm weather months so much! What are you 5 happy things today?? Flashback! 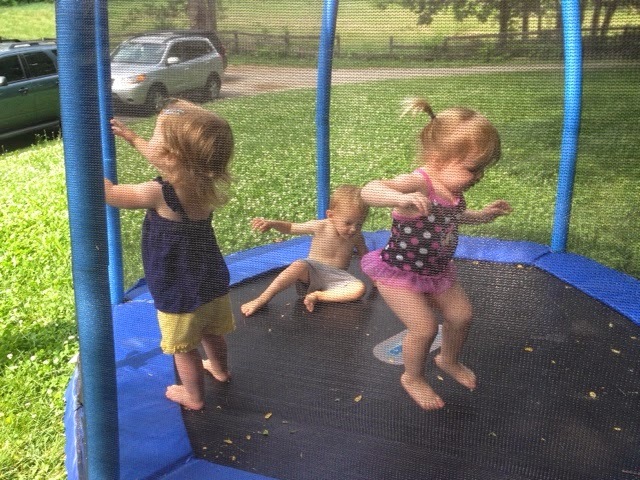 Here's what we were up to one year ago today: "Summer Fun"
And two years ago today: "Things Are Looking Up"
I love that. My happy thing lately is looking at my daughters big blue eyes, they make me so happy. She loves the song, "Blue Eyes" by Elton John. It relaxes her overtime. Something about his soothing voice. Listen to it on YouTube. Such a great song that reminds me of our love for blue. Sweet summertime for sure! I should do a 5 happy things post of my own!! Beautiful flowers! I'm right there along with Ayden - the berries this summer are amazing. Definitely a happy thing! You were asking for cabbage recipes. Sauteed w/apples is a favorite in our house. Carmelize onions in the fat. add a splash of honey, splash of vinegar. Add finely chopped apple just before onions are "there". Add in chopped cabbage when apples and onions are carmelized. Saute until tender. Make sure all the liquid is evaporated. Top with bacon and serve. All are positive about anew baby and not inferring that the new baby will bother the older sibling like some others I've found. Oops its obvious but I forgot to add season along each step with salt and pepper.